You may have seen on instagram, but last weekend I ended up with a few pairs of cheap Jeffrey Campbells, all thanks ot my incredible mother. There were quite a few pairs of Jeffrey Campbells all brand new in box at this charity shop. We did ask just how this was even possible, and I think what we gathered was that they were donated by a company of somesort (we think MAYBE parcelforce, either lost shoes or ones that got damaged in transit) they have a few slight marks on, so the kind you would find at outlets for cheaper prices. But very slight damages and marks - hardly noticeable! I came back with my mum the very next day and we picked up the Jeffrey Campbell Damsels for £59.99. They are much pricier, but for RRP £130 on the nastygal site I was pretty happy and they are gorgeous! 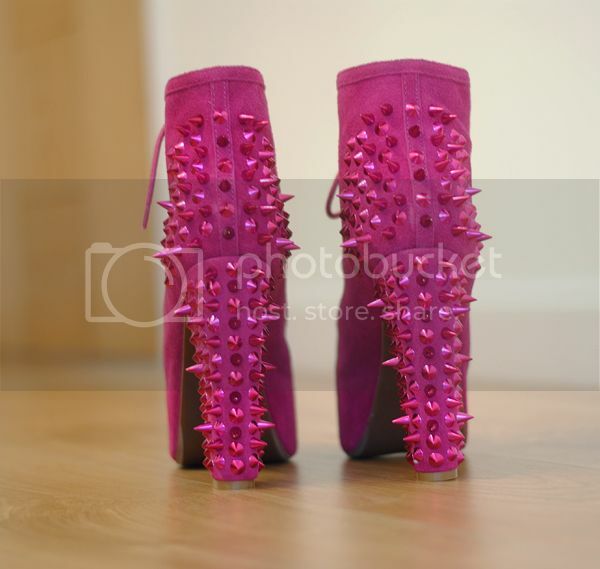 We also got these pink Litas as a present for someone - again these were only £40 and are the same RRP for £130. I think all of these we picked were exclusive to nastygal in general! What an absolute steal! Always let your family know about the brands you bang on about and one day, your thrifty mum might come home with a pair of brand new jeffrey campbells for you. And all because at the end of the day, she actually listens to me and my crazy ramblings! Who would have though?